Hi everyone! Are you sitting down? It's Sandy here with this week's tutorial - no stamping, no Copics! Yes, it *is* possible! 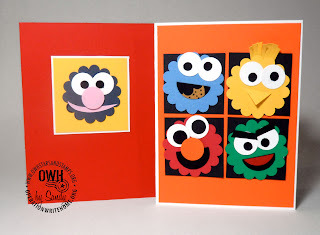 I don't claim to have invented these—I received some Elmos and Cookie Monsters from cardmakers—and I've added my spin to them. They're really easy so there isn't a lot of explanation...just get out your punches and have fun! These just make you want to smile. Great for kids to help make too! Either for their AnyHero cards, or as blank cards for our heroes to send home. 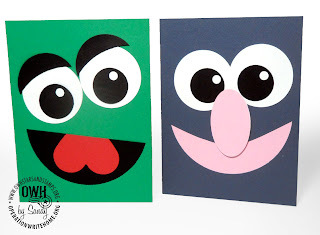 They don't even have to be Sesame Street characters....they can just be funny faces! Assess the paper punches you have on hand. You can also think about Nestabilities or other dies if you have them (those might be in a future tutorial, if you don't know what they are already! ), or using objects around your home for templates - plates, glasses, etc. Round, scalloped, ovals, squares. You'll need some basic paper colors — solids are best. 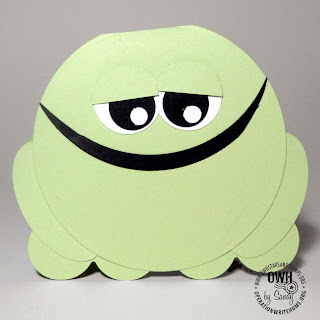 Simple colors...you can even use construction paper or fun foam! Joanns sells some inexpensive packs of a variety of colors - the solid bright colors work well for these. Cardstock for card bases. I recommend white bases, and cut the front panel to glue on—then you're not using potentially expensive cardstock for the whole thing, just one panel instead! Black pen - white pen - if you don't have punches the right size, you can draw and color in circles too; using objects around your home to trace the shapes! Dimensional adhesive if you want to pop a nose up off the card. I don't recommend getting too crazy with dimension - these cards are best left simple! Sentiment stamps and ink - Stamp these on the inside! The outsides are so simple and cute, you won't want to clutter them up with a message. Punch out a bunch of each shape and size you have. Note that you can cut circles in half to make eyelids or mouths too! Figure out which sizes work best for eyes—the smaller should be black, the larger white. 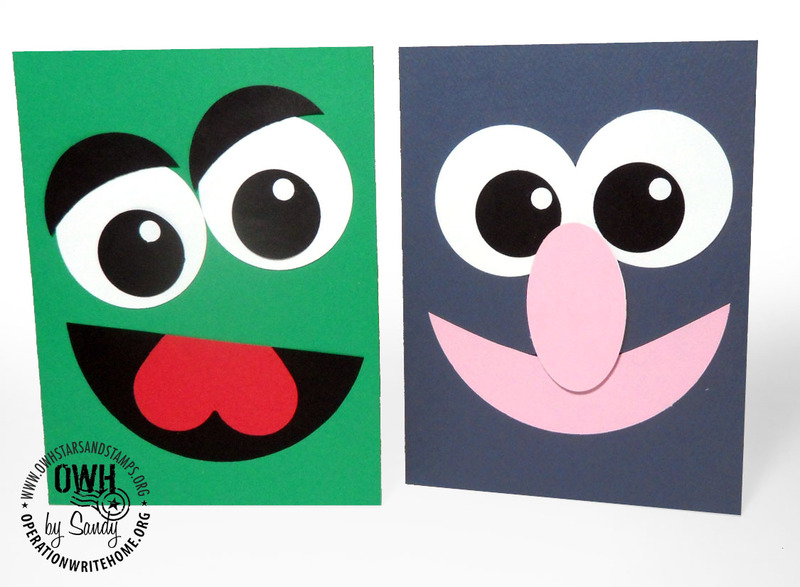 If modeling your card after a Sesame Street characater - google them to find out what they look like. Assess their eyebrows, eyeball shapes, nose and mouth shapes, and colors. See below for some examples I did with different characters. If you're making up your own faces - just have fun! Here are some samples I made based on different Sesame Street characters. You might find other ways to dress them up to look more like the characters, too! Or change them up and just make funny faces. On all these, I added a small punched circle as a highlight in the eyeballs — that's optional, but I think it adds a lot of life to the cards! Oscar the Grouch: He's green and has a red tongue - this one's made with a heart punch. His eyebrows should probably be a little rougher (try cutting out by hand) to make him more recognizable. On the right: Grover! Pink oval nose and a thin wide pink mouth. Who wants a cookie cookie cookie! Blue paper and a cookie in his mouth make this one clearly cookie monster. For the cookie, punch a circle, and take a "bite" out of it with a scallop. Punch dark circles for chocolate chips. Big Bird isn't as recognizable as Big Bird, but he's still cute even if he's just a bird, I think! His beak is a punched square folded in half, with a piece of dimensional adhesive between it. If you look at a picture of Big Bird, he has blue and orange eyelids, and I added hand cut 'feathers' as eyebrows. Bert and Ernie!! Their colors and crazy hair give them away. 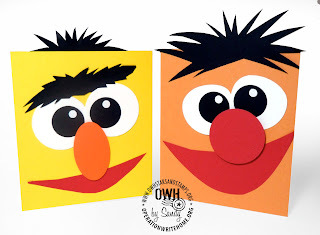 Bert has a unibrow and an oval nose; Ernie's got a bigger happier smile, round nose, and nice tuft of hair. Ernie also doesn't have round eyes like Bert - so I trimmed circles by hand to make odd shapes. I cut the cardstock short on both of these cards so the hair can stick out - but the card still fits into an A2 envelope this way. Once you've gotten used to playing with your punches, you can toy around with other things to make with them. These three little critters - max 4-1/4 inch tall so they fit in A2s - are made from punches! Can you spot the shapes? (Now this sounds like an episode of Sesame Street!) Note that each one has two sets of feet - one on the back of the front half of the card, and another on the back of the back side - so they stand up nicely. The cuttlebugged sheep has an extra circle of flat cardstock behind the embossed portion, to make it stay flat. Thanks so much for joining me this week and bringing along your paper punches! There's a few more of these on my blog, too - I've got the Count, Snuffy, some CASEd Frankensteins (perfect for Halloween) posted today along with an experiment for a strange 'human' face too....more to come I'm sure....I punched out a gajillion eyeballs and need to use them up now! I can't even believe how utterly and completely cute those are. I will be making them. Elmo is fabulous!!! Wonderful tutorial! I'll try my hand at this for OWH cards. Love the Elmo! These are absolutely adorable! I forget how much you can do with just punches. Thank you for sharing these. OH my gosh...so cute...so awesome...so quick....so fun!!! I'm on my way to my nesties and punches. These are just wonderful, and I can't wait to try this out too. The tutorial is great and should be easy to follow. Perfect cards to make for OWH! Thanks, Sandy. Sandy, these are really cute! Oh, I *love* your punch art, Sandy--can't wait to see all the other punch art people/critters everyone comes up with! These are super cute Sandy! Sometimes I'm just not in an "inky" mood, and these are all great for those times. I'll most definitely be doing some of these too! These are so cute. TFS. 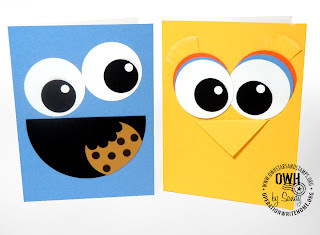 These cards are sooooooooo cute!!!! SO creative! I love them all! Oh my goodness! Can't wait to try one! My husband is Ernie so guess what's the first one? These are just fabulous for so many occassions. And my son would have LOVED to receive one of these from his dad when he's been "over there". Fabulous idea! Thanks for sharing!!! 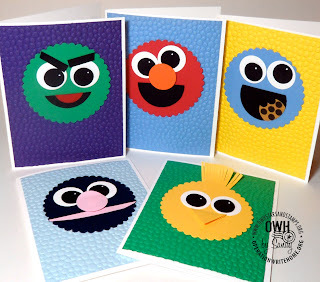 You are so talented and these are ALL wonderful FUN cards....perfect for ALL ages! Who can help by smile when you see these!! I am bookmarking this tutorial and your blog for future reference and want to THANK YOU for these great ideas!! Love them and can't wait to find some free time to give them a try!! Thanks so much for showing us these. I have made the card with 4 faces on it before but found it to be too time consuming. By doing the large ones it really speeds the process up. And on top of that they are darling! Thanks Sandy. What a great tutorial! Perfect for kids to play with punches. Thanks very much! Super fun! Thanks for sharing this! I feel a summer kids craft bonanza coming on...! These are awesome - I have a feeling the shippers will be getting a lot of kid cards soon! 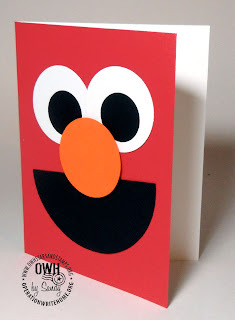 I'm planning to include a few of the veggie tales cards (as birthday cards) in my next box. Hope to get a few of my sesame street punch pals cards as well (as birthday cards). 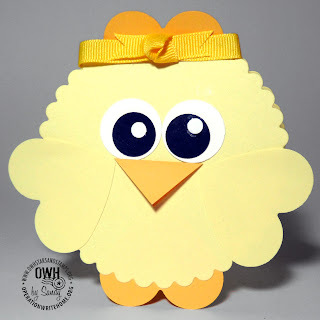 I wanted to let you know I posted a link to this tutorial today on my blog, PaperFriendly.